Self-control has seemed like such a burdensome "fruit of the spirit". Coming along with a full set of heavy baggage - do this and don't do that. Don't do this and you must do that. I should read my Bible. I shouldn't eat 2 desserts in one day. I should talk to my neighbor about receiving Jesus as their Lord and Savior. I shouldn't be so impatient with my child! The enemy would have see the fruit of the spirit through the lens of the tree of good and evil. We all pretty well know what is good and evil, but it never brings us life, with that lens alone, it only brings death (just go check out Adam and Eve's story). Let's change our perspective today. 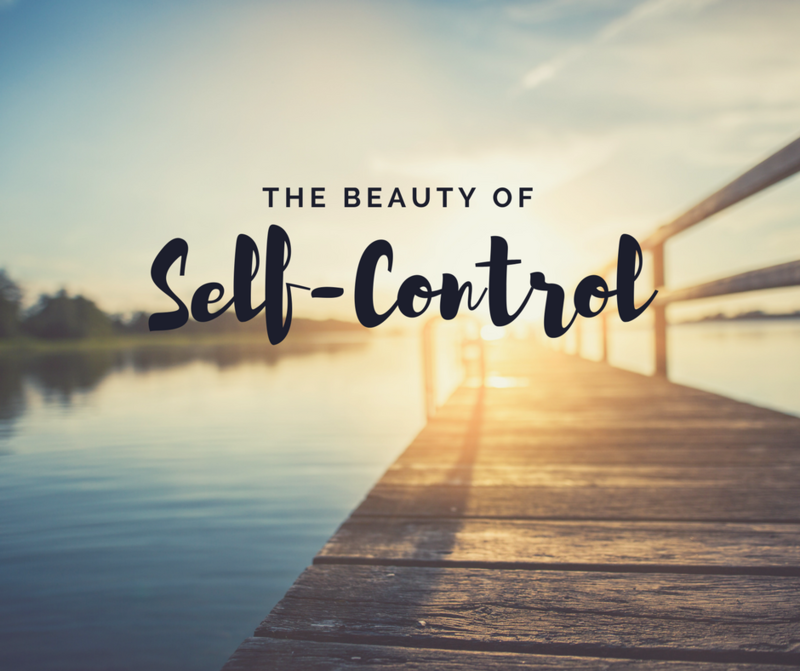 Let's look at self-control through the lens of life and life more abundantly. So where is there life? There is life in the presence of God. Ha! That's the secret. Really it is the secret of all things. In God's presence, we come alive, we release his life, and we reveal his glory,. So to participate in self-control (a fruit of the spirit), let us lean our hearts right now into the presence of God. Meditating on that God the Father adores us. Look, can you see the eyes of the Father, who has a twinkle in his eyes, bubbling with laughter and joy and songs over being with you. He's so so very excited that you are here with him. Dive in and drink deeply - his love is so wide, and so deep, and so long, and so high for you that you won't be able to find its end. Now think of the circumstances that you are in right now or list for the day that you have before you. Is it the dishes, the lunch meeting, the business deal, the sick child, the unresolved issue? Whatever it is, show your to-do list to God and listen to what He has to say about it all. Take a minute. Take 2. Take 15. Take all day. I give you permission to be in His presence with your list for the whole day. He may not saying anything about it. But He's probabaly going to say something. And that is when you take the next step to activate self-control. The Holy Spirit is bouncing off the walls of your innermost being wanting to be a part of the Father's will. Wanting to empower you to life, and life more abundantly. Wanting to enable you to do that which you just heard the Father say is His will to do. So will let Him? Take a moment and invite the Holy Spirit to be the force walking you through the will of the Father. You see any fruit of the spirit has NOTHING to do with self-reliance. The fruits of the spirit, including self-control, only grows by being the branch attached to the vine. Self-control grows through total reliance on God the Father and the Holy Spirit, through your position in Jesus Christ. And that is beautiful, not burdensome.